America is teeming with wilderness for travelers to explore. Many of us find peace and relaxation in the secluded wilds of the national parks. There are fifty-eight national parks with countless trails and miles of forests. You could spend a lifetime hiking the national parks and only see a fraction of the beauty they offer. Many of us don't have a lifetime, just a few days to catch a break from our everyday grind. What better way to spend your vacation than enjoying the fresh air on the peak of a snowy mountain, camping in a luscious rain forest or taking in the still silence of golden meadows? With this thought in mind, let's spend the next few minutes discovering some of the best day hikes you can find in Americas national parks. If you do not mind trekking in the cold mountain air, then add the Highline Trail in Montana to your bucket list. Traversing this path will take you 15 miles, round trip, through the mountains of Montana. This trail is exceptional because if offers a combination of natural marvels over a short distance. The trail leads up mountains, along glaciers and through areas of rare wildlife including grizzly bears. The scenery and wildlife gives the feeling of being in Alaska, yet with easier hiking. If you have ever dreamt of hiking in Denali National Park in Alaska, then Glacier National Park is the next best thing. I love Zion National Park in Utah and have mentioned it often for several reasons including Buckskin Gulch. Not only is it the deepest slot canyon in the Southwest, but it is also the longest slot canyon in the world. The Canyon Walls gradually close in until hardly any sunlight penetrates through the narrow cracks of the steep, rugged cliffs. At certain points, you might find yourself wading in water up to three feet deep. Due to the lack of sun and the large amount of water flowing through the canyon, the walls are covered with abstract designs making the gulch mother natures personal art piece. 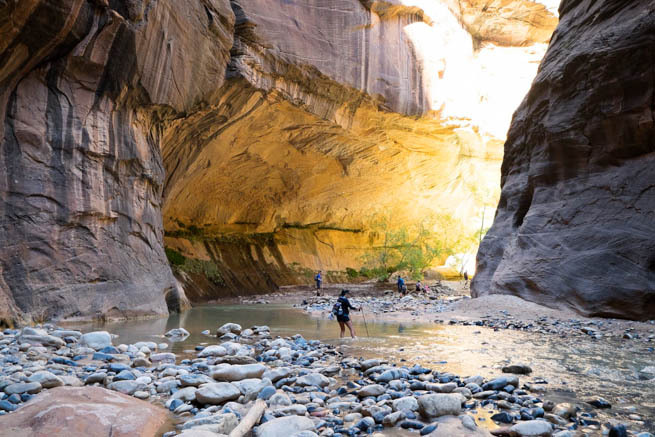 While Buckskin Gulch has a yearlong hiking season, careful planning is required as flash flooding has been known to happen during the summer. Starting at the bottom of Yosemite Valley in northern California, an uphill trek of 3.5 miles leads hikers to the peak of Yosemite Falls. Not to worry though, the hiking is easy and well worth the reward of standing on top of the fifth tallest waterfall in the world. The trail provides vast views of the gorgeous valley below. Peering over the falls gives a heart pounding, stomach dropping sensation while watching water tumble over two thousand feet into valley below. One of the coolest things about hiking in America is the diversity of natural settings. The country has vast deserts, steep mountains and even large rainforests to hike. There is nothing quite like the Hoh River Trail in Washington. The 6.2 miles offers a variety of trees soaring into the sky and massive ferns that pad the trail floor. Beams of sunlight pierce through the thick foliage and illuminate the path to crystal blue ponds shadowed by glaciers. There are no trees in the world that can match the size of the gigantic redwoods found in California. The best trail in the park is the Tokopah Falls Trail which ends with a 1,200 foot waterfall. The hike starts beneath the redwoods and soon climbs into the mountains. As the trail ascends, the trees grow smaller and are replaced by grassy meadows. At the top is an area known as the Watchtower which overlooks Tokopah Falls. The sky view of the enormous redwoods is spectacular and the Great Western Divide is also visible in the distance. America's national parks entice hikers and leave them spellbound. Exploring the outdoors gives the feeling that this is what the country is meant for. In a nation packed with trails, these day hikes are truly special and show the grander of this untamed land. Be sure to download the RoamRight app to check security warnings no matter where you're going.